MONDAY, May 22, 2017 (HealthDay News) -- Several new recommendations from the American Academy of Pediatrics may just send toddlers into tantrums. One recommendation is that fruit juice be limited for toddlers and older children, and babies shouldn't have any at all before their first birthday. Another recommendation is that parents should forgo the beloved sippy cup for their children altogether. 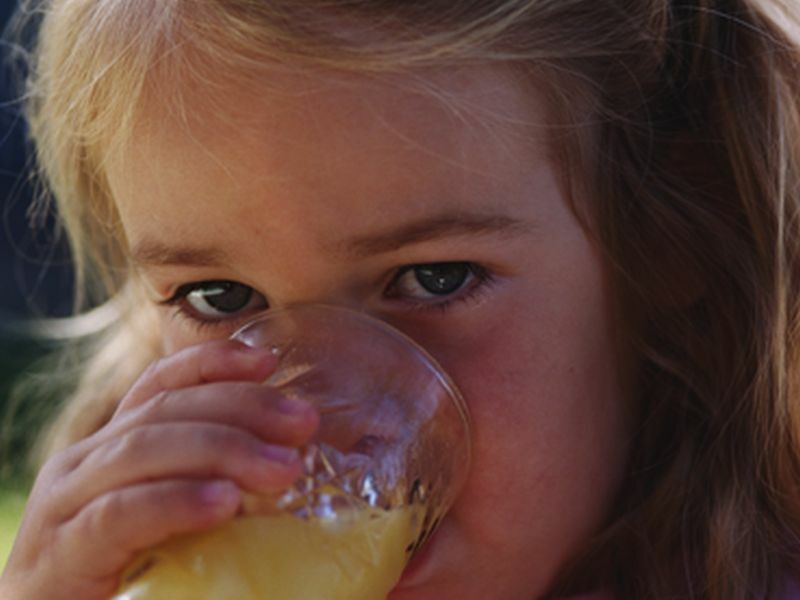 The advice is the first update to the AAP's stance on fruit juice in 16 years. The major change is that fruit juice is discouraged for the first year of life -- and not just the first six months, as previously recommended. "There's just no need for fruit juice in infancy," said Dr. Steven Abrams, one of the authors of the report. "There's no evidence there's any health benefit," he added. Abrams is chair of pediatrics at Dell Medical School at the University of Texas at Austin. If anything, he said, offering babies juice could keep them from getting enough breast milk or formula -- and the needed protein, fat and other nutrients they contain. Plus, the AAP says, once babies start eating solid foods, they should have whole fruit that is mashed or pureed, rather than juice. Babies do not need additional liquids (other than breast milk or formula) once they start solid foods, Abrams said. As for older kids, the AAP suggests limits on juice: 4 ounces a day at most for toddlers ages 1 to 3; no more than 6 ounces for 4- to 6-year-olds; and no more than 8 ounces a day for older kids and teens. What's so bad about fruit juice? Abrams said the point is not to "get dogmatic about it," and kids can have some juice as part of a healthy diet. But for too many kids, the AAP says, juice becomes a replacement for whole fruits and vegetables -- and the fiber, vitamins and other nutrients they provide. Plus, many beverages are not fruit juice at all -- but fruit "drinks" that are basically water and sugar. Kids should have only 100-percent fruit juice, with no added sugar, Abrams said. But there should be limits even on those juices and their natural sugars. The bottom line, Abrams said, is that "water and milk are preferable." Dr. Alisa Muniz Crim, a pediatric gastroenterologist at Nicklaus Children's Hospital in Miami, agreed. She also said that if parents go for milk alternatives, like soy or almond milk, they should make sure there is no added sugar. According to Crim, it's important for children to learn healthy eating habits from an early age -- which includes developing a taste for whole fruits and vegetables rather than juice. Another piece of advice from the AAP: Don't give toddlers "sippy cups," which are generally cups with a cover and a spout or opening. For one, Abrams said, toddlers should learn how to drink from regular cups. Plus, sippy cups and bottles allow kids to easily sip on juice all day. "If they are running around with the sippy cup all day, it's going to be refilled," Crim pointed out. One concern is that sippy cups can affect children's teeth, Abrams said. When baby teeth are exposed to liquids other than water for prolonged periods, it can promote tooth decay. The other worry is that the liquid calories in juice could contribute to excessive weight gain. "I don't think that limiting fruit juice is the answer to childhood obesity," Crim said. "But it is one simple step that makes sense." If parents choose to use those sippy cups, she added, they should fill them with water. The new guidelines were published May 22 in Pediatrics. Learn top parenting tricks for calming crying, colicky, and fussy newborns and babies from this WebMD slideshow.